People are spending more and more time on screens nowadays. And chemists too! 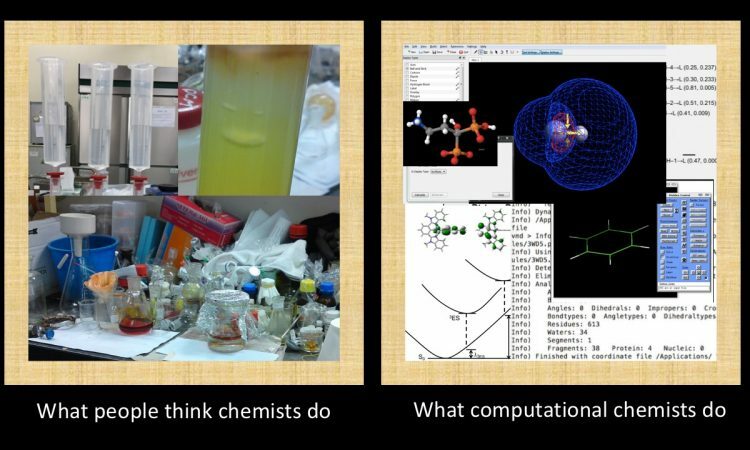 While chemists may always get the impression of people wearing white gowns, holding test tubes and mixing colorful liquids, some chemists prefer to stay behind the screens and perform chemistry experiments with keyboard and mouse! Computational chemists use codes and software to understand molecules, reactions and electron movements. In short, they perform experiments with computers! Some chemists aim at developing methods to obtain more accurate results, some look into the interactions and reactions between small molecules while others simulate larger molecules such as proteins and DNAs to understand their molecular behaviors. Quantum mechanics (QM) may appear as an abstract concept in physics, yet, it is the mother of computational chemistry! Since QM involves solving many complicated equations, computational chemistry often uses numerical approximations in practice. Instead of solving for the exact solution, chemists utilize computational power to find the unknown by iterations (Figure 1). This kicks off with a reasonable guess for the unknown in the equation. Computers then return a preliminary solution. This process continues by refining the guesses until the solutions of subsequent attempts have insignificant differences. The refined guess is considered as the good-enough answer of the unknown. 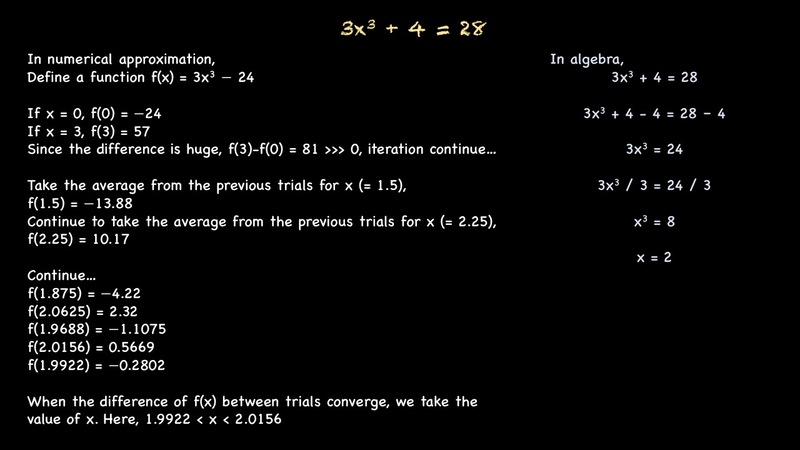 Figure 1 Solving an equation numerically versus algebraically. So what are the unknowns? Electrons. They play a critical role in determining how molecules behave. However, it is extremely hard to simulate electrons, not only there are many electrons in a single molecule, the interactions among electrons and nuclei also complicate the problem. Therefore, instead of treating electrons as individual particles, chemists treat electrons as either waves or a group of electron density. For when we compare two cups of water, we do not count how many water droplets are there in each cup, but rather measure the volume or weight of water in each cup. By grouping electrons as waves or densities, chemists manage to compute the energies of molecules and their corresponding properties. Density Functional Theory (DFT) is currently a very popular method for small molecules analysis. It uses electron densities in calculations to solve for the energies of molecules. It is one of the crucial tools for simulating structure and spectra of molecules and therefore highly useful in understanding small molecules and their interactions. Back to Chem101, electrons, atoms, and molecules always love to sit at the lowest possible energy state. Just as you will continue to change your posture until you find a comfy position, electrons behave similarly. Chemists start with a reasonable guess of a molecular structure, DFT then searches for the structure with the minimum energy. This structure is so-called optimized and often compared with the experimental crystal structure for verification. This optimized structure then becomes the basis for further study, for example, to simulate absorption and emission as well as how molecules approach each other in reactions. While DFT works pretty well for small molecules or single molecule, large molecules such as proteins and DNA contain so many electrons that takes up much computational time for DFT calculations. Therefore, instead of tackling electron density as in DFT, chemists jump up to another macroscopic level. They use a set of equations to represent molecular geometries and selected properties of macromolecules. These set of equations are called force fields, as they describe the forces between atoms in the macromolecule. Similar to DFT, chemists obtain the optimized structure by minimizing the energy in force field calculations. It is the core for further study of molecular properties in molecular dynamics calculations. Nowadays, computational chemistry is indispensable and complementary to experimental work in many different areas. In particular, it has a great impact in the field of drug discovery (check out this chembite!) and there is also a growing interest in computer-aided drug design. This implies that computational chemistry not only has the power to provide insights for better understanding of molecules and observations but also capable of making reasonable predictions for future molecular design! Computational chemistry is certainly much more than computers and chemistry!